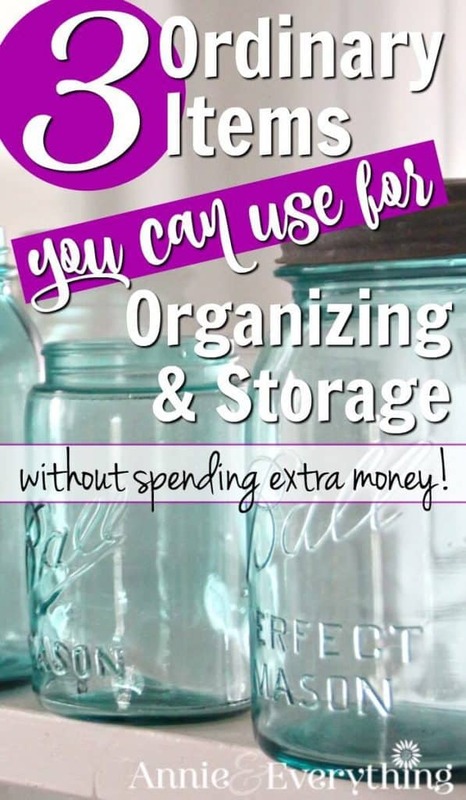 Home » Cleaning, Organizing, & Time Management » 3 Ordinary Items You Can Use for Organizing and Storage — without spending extra money! 3 Ordinary Items You Can Use for Organizing and Storage — without spending extra money! I love pretty magazine pictures with beautifully organized shelves, don’t you? The kind where everything is stored in identical black baskets with little calligraphized labels. No strings hanging out, nothing sticking up out of the top — oh, and the shelves themselves are pristine white inside a gorgeous antique cabinet. Sigh. But that’s not reality, is it??? At least not in my house, and maybe not in yours. The reason that beautiful storage is not feasible for the real world is that it is PRICEY to organize stuff like that. Those cute little black baskets cost serious change, hello — especially when you buy several of them for a consistent look. Well, I’ve had to give up the gorgeous organization dream and accept that my life is not about cute black baskets but more about whatever I can find that will do the job and doesn’t cost an arm and a leg. 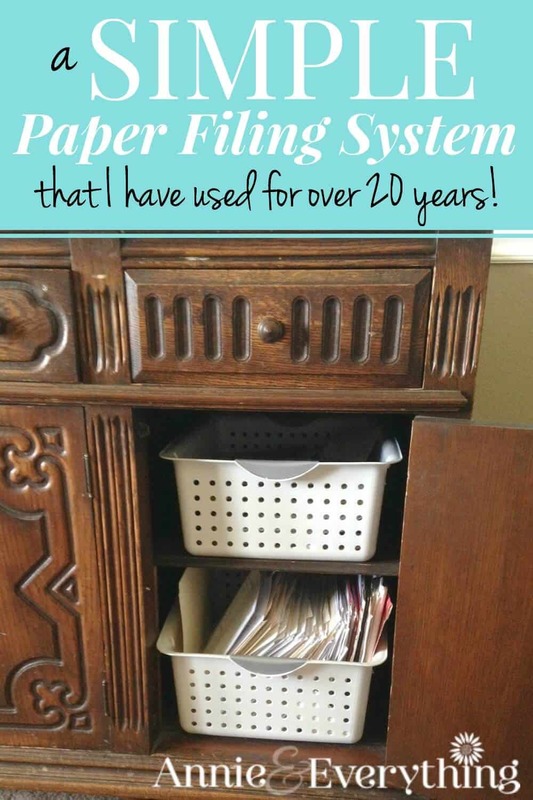 And there are three items I’ve found that are basically free and deserve a shoutout because they fill the need for so many different organizing and storage uses. Amazing item number one: the ice cream bucket. This item is not technically free, because you have to buy the ice cream first — but who doesn’t love an excuse to buy ice cream? It definitely will NOT go to waste, lol. And then after you’ve consumed the .75 gallons of your favorite flavor, you have a beautiful bucket with a lid that you can use for organizing and storage of all sorts of stuff. My favorite use is as a cleaning supplies bucket. I have mine stocked with my most-often-used cleaners, an old toothbrush, and a scrub brush; and it sits under my kitchen sink. It is so easy to grab a cleaning cloth and this bucket and take it all to wherever I am working. Or you can use the thing as an actual CLEANING bucket — i.e., you put the water and cleaning product INTO the ice cream bucket and dunk your cloth in. This works great for carpet spills/stains or washing off large items. Like your car, hello. An ice cream bucket can be hanging out in your laundry room to receive dirty cleaning cloths until you’re ready to put them in the washer. It can be the receptacle you keep you homemade laundry soap in. It can hold your food processor blades and/or mixer attachments — totally true story, there is one in my cabinet doing that right now. These buckets are roomy but SHORTER than your usual bucket. So they fit on shelves in your pantry or cabinet pretty easily. I also have one filled with a variety of colored paper plates, napkins, and plasticware left over from various functions. When we decide to eat out on the deck, we grab it and take it with us. In the shed it’s perfect for gardening gloves and that little hand-held rake thing and trowel — even packets of seeds — just snag the bucket and head for the garden. The beauty of the ice cream bucket is you can use it for all the dirty stuff that you wouldn’t want to spend a lot of money to get a storage receptacle for, anyway. It’s easy to rinse out as needed, but if it breaks or gets treated poorly — no biggie. Just get some more ice cream! Wonderful storage item number 2 — and I just discovered this one recently — a ramen noodles box. Instead of buying individual packets or cups, buy the box of 6 cups or 12 packets — and then KEEP THE BOX. It is a GREAT size for everyday storage in your pantry or on other shelves where you don’t need a big basket, just a smallish rectangular container. You can buy plastic baskets practically the exact same size at the store, or you can buy Ramen and use the boxes. Again, what’s nice about these is that when that pantry item explodes and the box gets covered in slime, you can just throw it away. No cleaning necessary. In my pantry there is currently one holding onions and sweet potatoes, and another piled with bags of rice and dried beans. A third has rolls of kitchen trash bags. And another holds individual chip bags and oatmeal packets. The bags and boxes they came in were too flimsy to make the grade at my house, lol. I would NOT recommend that you go buy Ramen JUST to use the boxes; but if you are already buying Ramen, then don’t overlook the beauty of the box. Just sayin’. Item number three that I adore: Mason jars. Or any jars, really. But mason jars in particular are just so NICE. They have such a cool look about them, and those nifty lids with the rings? So fun! And chances are you already have some. Do you buy spices in pound bags from Amazon (like the referral ad below)? I do, because you can get organic spices for less per ounce than non-organic that come in those tiny jars at the store. So when a bag arrives, I open it and put the spice in a mason jar. That way it is sealed and will keep longer. I do the same with corn starch, baking soda, beef gelatin — anything powdered that comes in bulk is fair game for a mason jar. They are so much easier to dig a measuring spoon into than those silly boxes with the serated flaps. In my cabinet there are several mason jars on a lazy susan; I just twirl it around to get the one I need. Chicken stock that you make from scratch — pour it into jars and freeze. Then you have it already portioned out when you want to make soup. Or pasta. Or dried beans. Or homemade salad dressing or yogurt. My daughter arranged some of them into a horizontal pyramid and hot-glued them together to make a nifty gadget holder for her desk. So there ya go, three ordinary items that make GREAT organizing and storage containers! Try them for yourself! 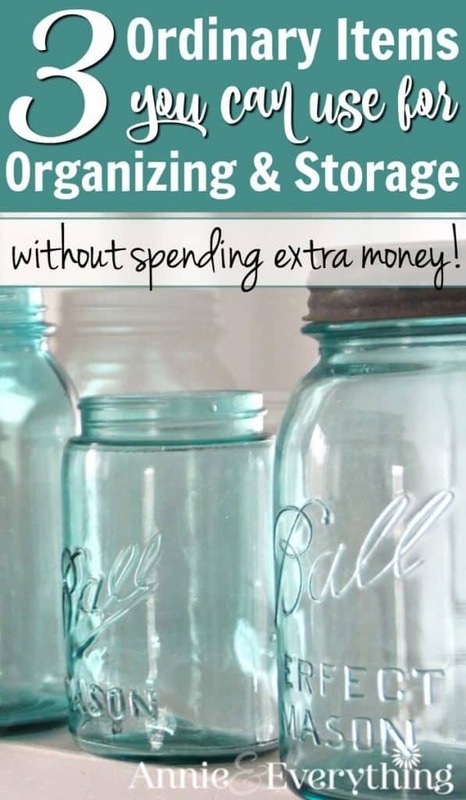 For other ideas about how to organize cheaply with things around the house, read this: When You Want to be Organzed but Think You Can’t Afford It. This has been an AnnieThing. An AnnieThing is a practical and easy tip or idea that will help make your life run more smoothly — because we can all use a little more “smoothly” in our lives! 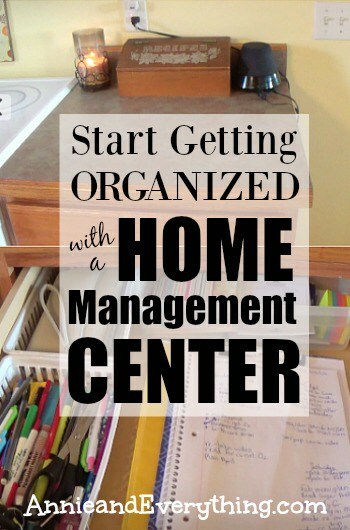 Start Getting Organized with a Home Management Center — Day 1 of a 30-day Collaborative Series! I use my ice cream bucket for food scraps that go out to the chickens. Fruit boxes are beautiful storage containers, too. I have gotten lovely orange boxes just for asking in the produce section. I use an ice cream bucket for food processor blades, too! I use one for clothes pins and one to soak gloves and other small clothing items. My boys organized their legos by labeling square buckets and stacking them on a book shelf. Super cheap and neat! Thanks for your ideas and encouragement. That is a great idea to use it for soaking clothes! I usually use a dishpan, but sometimes that is too big. The ice cream bucket would work perfectly! Thanks! We use an ice cream bucket for our pets’ water dish. My favorite thing too is ramen boxes I use scrap fabric and spray glue to pretty them up and the big buckets of empty little litter. The empty litter containers can be screwed together to make an entire shelving unit or as tool holders ect. And the jugs my coffee creamer come in are perfect for a lb of beans or rice. I like to reuse the tall wipe containers too. The can hold makeup brushes, combs, extra toothbrushes. And large spice containers are perfect for baking soda. You can keep one in each bath and sprinkle what you need to clean drain or as a mild abrasive. I use an old parmesan cheese container for my “cleaning” baking soda — even has the lid just ready for sprinkling! Thanks for all the good ideas!